I have to admit that the defense was way easier than I had anticipated. In fact, I got to spend much of the two hour question session talking about possibilities for future citizen science projects and the cool things that could be done with camera trap surveys. Once things settle down on my end, I’m looking forward to sharing some of my most recent results here on this blog. …But it might be a few weeks. Right now I’m in Brazil, crewing for my boyfriend in the world hot-air balloon championship. We are centered in Rio Clara, and this place is beautiful. Although more cultivated than some of the places we are used to flying (e.g. Serengeti), we have still managed to find some wildlife. When we (the chase vehicle) managed to find the landed balloon past a maze of 12-foot-tall sugar cane fields, the co-pilot looked at me nervously and said, “there are no hyenas in South America….right?” Because apparently they had seen a rather large canid ripping into some carcass on some abandoned hillside on the flight. And it turns out that there are maned wolves here, which is probably what they saw. Maned wolves actually vaguely resemble giant red foxes (~ 3 ft tall at the shoulder), and are in a genus all their own (Chrysocyon), and are considered “vulnerable” (as a species) by the Brazilian government. They are pretty cool. Funny story. When I was applying to graduate school, long before I decided to work with Craig at the University of Minnesota, I had wanted to study maned wolves in the Brazilian cerrado (tropical savanna). And, in the end, I turned down an offer to do so in favor of coming to UMN. But wouldn’t you know it, 6 years later, here I was – right in the middle of maned-wolf country! Granted, *I* still haven’t seen a maned wolf here, as is usually the case. The balloon pilots, with their birds-eye view, always see the most spectacular things. We on the ground just hear about them. But I’ve got nearly two more weeks here…and I’m on a mission to find me a maned wolf! Well done, Dr. Swanson! Congratulations on all your hard work and best of luck on your maned wolf search and to your boyfriend on his hoped-for balloon success! 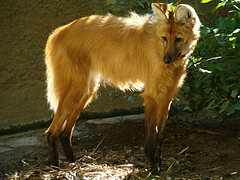 The maned wolf is a beautiful creature. Hope you get to see one! Congratulations, Ali! Both on your successful defense and on your new job! Congratulations! It’s been fun watching from the sidelines.